Autumn is here and I’m loving it! One day we’re on the beach then next we’re making soup! Variety is the spice of life! Soup made with quinoa will keep you fuller for longer, due to the high protein content of the quinoa. You can either find lots of recipes online or just throw a handful into your fav soup recipe – it’s not going to spoil a soup – only enhance it. 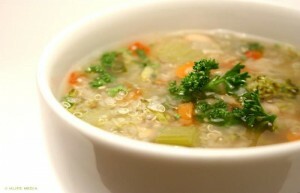 I, of course, use our quinoa blends to make really quick and easy soups! I throw half a packet of quinoa into a pan with 750ml of stock, fresh carrots, sweet potato, pumpkin etc – whatever I have in the fridge really! The Sundried Tomato and Kalamata Olive is one of my favs to use. I make some sour dough toast from our beautiful local bakery, Home Grain at Aldinga, sit myself down, and enjoy! You can get our Quinoa from our online store if it’s easier for you http://thistlebegood.com.au/product-category/quinoa/ – only $6 freight anywhere in Australia! Click here http://www.foodnetwork.com/recipes/food-network-kitchens/chicken-and-quinoa-soup-recipe.html for quick and easy Quinoa Soup recipe for you try, courtesy of Food Network – great to take to work for lunch too!